Looking for fun and easy kids gardening ideas? If you want to get them started young, here are a few garden ideas they’ll surely love. Have I ever mentioned how much I love gardening? I’m sure I have on more than one occasion. I’ve been gardening for as long as I can remember and I have my mom and grandma to thank for that. So when I had kids of my own, I made sure that I taught them a thing or two about tending their garden. If you also want your kids to get started with gardening, here are a few ideas and gardening projects they can try. A great gardening project for little girls. Help them build miniature gardens for their fairy friends. You can also follow this simple step-by-step guide for a DIY miniature fairy garden. Most kids love to color and paint, so much so that your white-washed wall sometimes falls victim to their artsy side. Bring out your kid’s creative imagination and teach them how to make painted rock garden plant markers for your garden. You know your kids will love the outdoors when they start getting curious about birds. Sooner or later they’ll start bugging you to help them feed their feathered friends. Get the step-by-step guide to a simple and easy DIY bird feeder here! This cute and affordable kids gardening tool set is perfect. They’ll love having their own mini version of all the basic gardening tools. Get it here! What better way to get your kids creative in the garden than familiar and well-loved TV characters. Minions are forever favorites and these minion planters will get them excited! Get the step-by-step guide on how to make a minion planter in this video. Gone are the days when a tin can was a great find and you could go crazy making all sorts of crafts with it. Well, it’s not too late to reintroduce tin cans to your kids as a blank canvas for all sorts of creative pursuits, especially in the garden. If you get hungry gardening, here are a couple of recipes kids can try! Now, this is the bomb! Throw one into your yard and it’ll scatter all the wildflower seeds. It’s fun to make and are great for your own garden or as a gift. Teach your kids sustainable living early by showing them the value of recycling. Start with their milk cartons which you can transform into useful gardening items such as this milk carton planter. Get playful with your kid and tickle their imagination with this garden decor idea! I’m sure your kid will love to make this tiny gnome door with you. Feed your kids curiosity by letting them grow veggies without soil. Regrowing kitchen scraps, like say, spring onions will certainly develop some growing skills in them. Sooner or later, they’ll start to experiment with actually growing plants in the soil. Kids love flowers and I know that for a fact with all my flowers falling prey to their little hands. Let them in on this interesting and magical DIY rainbow roses experiment. You can also use white flowers with larger flower heads like chrysanthemums for starters. Mind your kids’ creativity by doing an arts and crafts project in the garden with them. Your plain planters could sure use some revamping with your kid’s artistic imagination. Take your garden indoors and start making this beautiful terrarium with the kids. 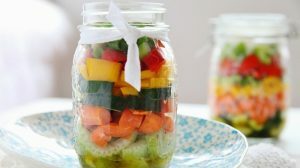 You could use a mason jar too if you want! Don’t you think these ideas are exactly what your kids need to keep them off the couch? Well, they’re exactly what got my kids into gardening. Get your kids to spend more time out of doors with these simple yet fun kids gardening ideas! Which garden idea will you make with the kids? Let us know below in the comments! Haven’t got around to building that tree house your kids are bugging you about? Check out these awesome treehouse ideas and be inspired!